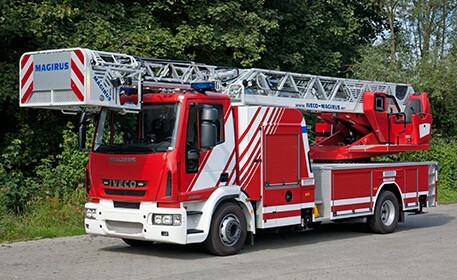 “Because there are no second chances in an emergency, everything has to be right from the start.” Fully behind this slogan, HELUKABEL® was commissioned by Iveco Magirus Brandschutztechnik GmbH to develop a cable for turntable ladder vehicles, such as fire engines. Extreme bending cycle movements and loads, including a constant tensile load to prevent the swinging of the ladder, presented the development engineers with a challenge. Alongside these various mechanical loads, thermal influences also had to be taken into consideration. When using the vehicles on site, the functional integrity of the cables must be ensured so that the emergency vehicles equipped with them can reliably perform their services. Otherwise, outages could have fatal consequences. In close collaboration with Iveco Magirus, the cable was designed, constructed and continuously improved until it fulfilled the all the requirements. The cable was created with power and signal leads. Combining both power and signal into one cable while also observing the specified bending radius and cycles represented a major challenge. Another central element was a steel-wire core, which served as a strain relief. In this regard, Iveco had specified a special test setup in which the cable was tested according to defined parameters such as speed, bending radius and train weight. Parallel tests took place as early as the development phase so that any weaknesses could be identified and rectified immediately. To do this, the employees in production at Windsbach set up a comparable test apparatus. The aim was to give the customer a cable for sampling that corresponded to the quality of the production series. The joint development and comprehensive test programme paid off. After a development time of several months and numerous test cycles, we were able to present the client with a product that fully complies with all necessary parameters and, in some cases, even exceeds them.